The McHale 998 square bale wrapper is the versatile high output solution for wrapping square bales. 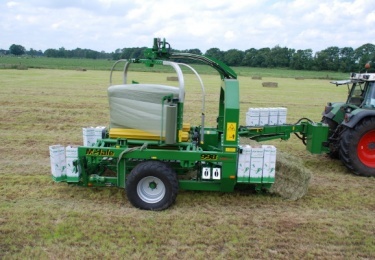 It is capable of wrapping 80 - 100 bales per hour. -Load one square bale onto the front conveyor. -Move a second square bale from the front conveyor into the wrapping position. -Eject the last wrapped square bale off the back of the 998 square bale wrapper.